Further I would like to inform you that I moved to Alumni Status in the Oracle ACE Program. All the best to the ACE program and thanks for all the support during that time! 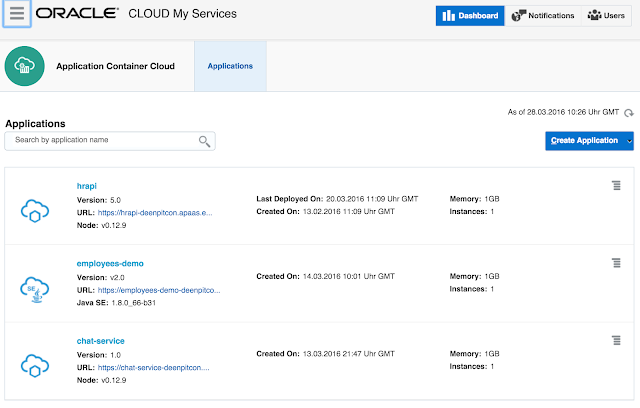 Checkout my new post on Oracle Container Cloud Service! Today it is time to say "Thank you" to the Oracle Technology Network (OTN) for keeping up one of the worlds greatest developer community. One cool thing within the Oracle Development ecosystem I really like is the availability of an technology agnostic Design Guide, including Style, Patterns, Cookbook, etc. called ALTA UI. Besides containing best practices for designing great User Experiences it allows to introduce new technologies under the covers. 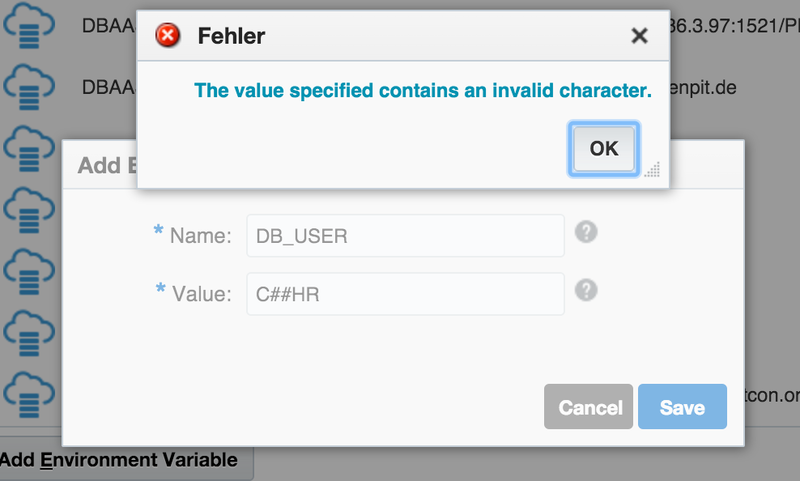 The user does not notice if something is build in ADF, JET, MAF or technology X which implements the Alta UI Patterns. Checkout some of the featured Alta UI Demos. 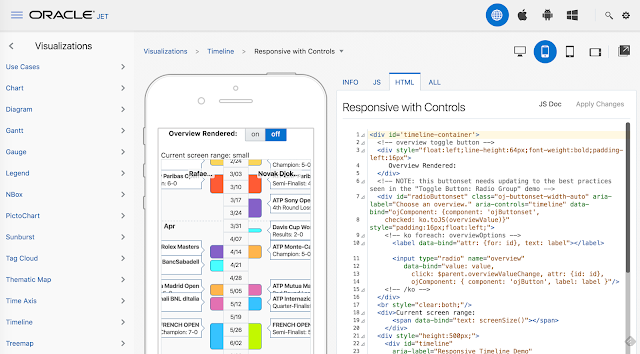 Checkout Alta UI Design Pattern Library. The new Cookbook looks awesome. Oracle is making great progress in the Cloud. 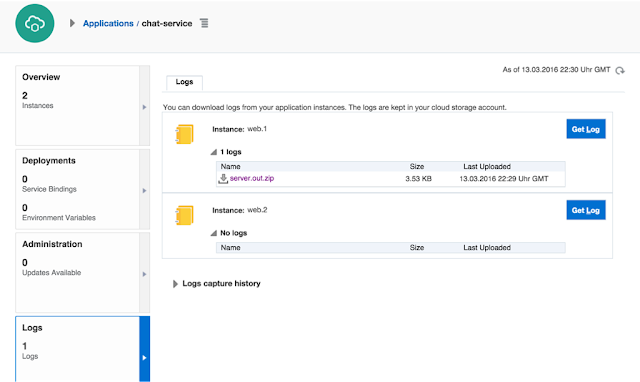 One of the recently released Cloud Services is the Application Builder Cloud Service (short: ABCS). In this post I want to share my first impression in using ABCS for building modern web applications - responsive and optimized for mobile. 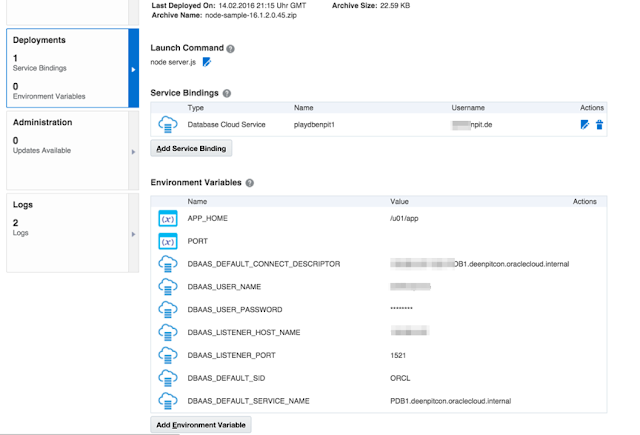 For the backend I am using an exposed REST Service through ADF Business Components. You have created a new ABCS application. 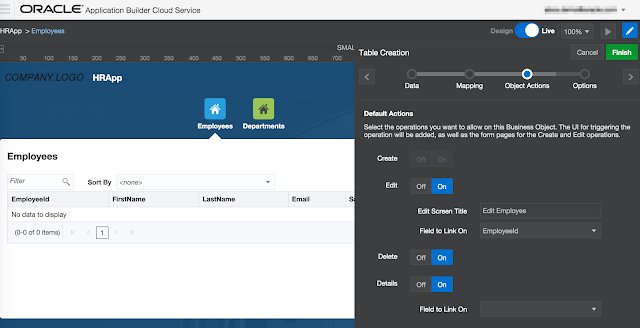 Choose "Add Custom Services" and provide details to your REST resource. 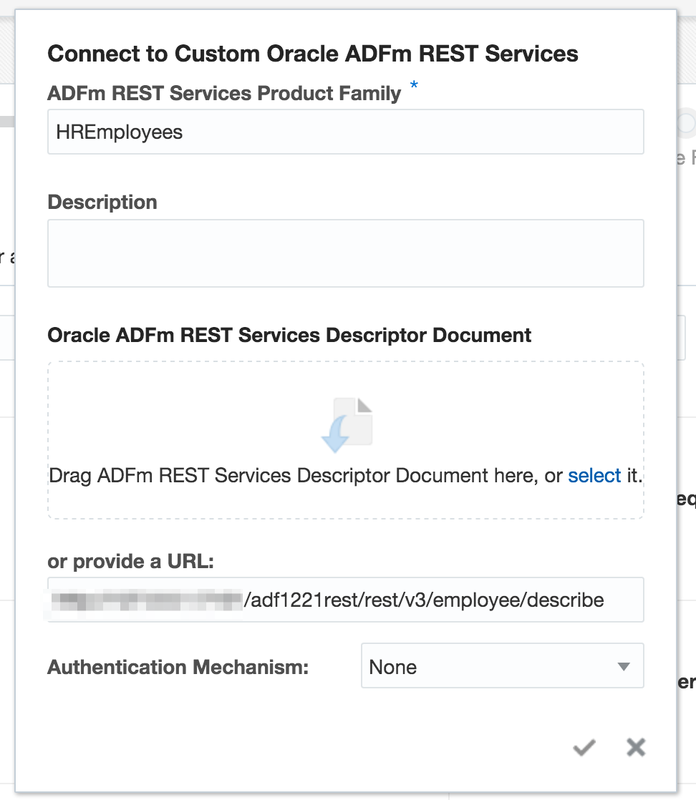 In this case a URL to the ADF REST Services descriptor is expected. After submitting the form the REST service will be parsed. The containing resources are being shown in the next wizard step. Select the "employee" resource and go to the next step to fine tune the naming, paths and child resources if available. Finishing this last step the Business Object(s) are all setup to start building the UI. From the Data Designer switch to the Page Designer. (I am assuming here a page employees is already created). 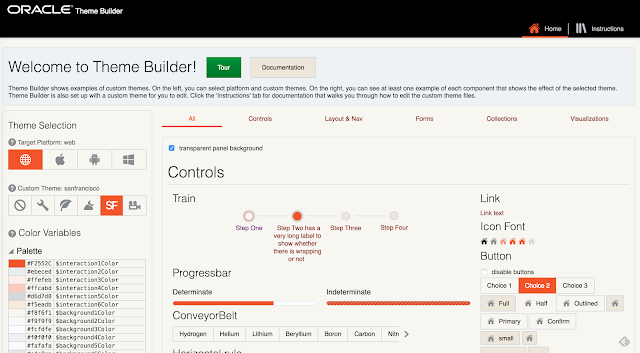 Select Table from the Components Palette and Drag And Drop on the Page canvas. On the right side the Table Creation starts. Choose Employee Business Object. In the next step (Mapping) select fields you want to be used for the Table Columns. This is done by DnD from Available to Selected Pane. The table will be readonly. With just some configuration options like 'Create on/off', Edit 'on/off', Edit Screen Title, 'Delete on/off' etc. you can let ABCS generate corresponding actions and Screens. The is a great feature for many typical use cases! On the last wizard step you might want to configure Filtering, Sorting and further options like table summary for accessiblity. As mentioned before when selecting to create the "Edit Action" ABCS generates the Edit form for you that you can further fine tune in terms of required fields, label positions, etc. 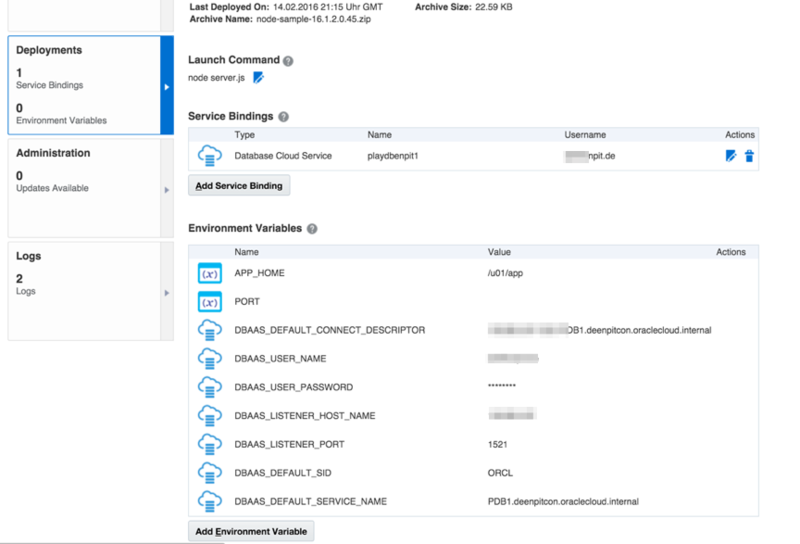 Oracle Application Builder Cloud Service feels like ADF for the cloud era. Having APIs as your backend (not coercively a DB) you model Business Objects which are the basis to wire the desired UI components. 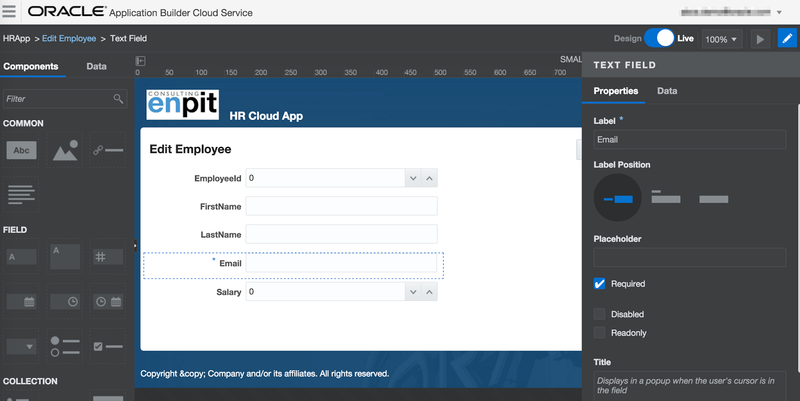 The resulting applications are being deployed with a push of a button on Test and Production Cloud Environments. Awesome! Be part of the ABCS Community and follow the ABCS Youtube Channel. 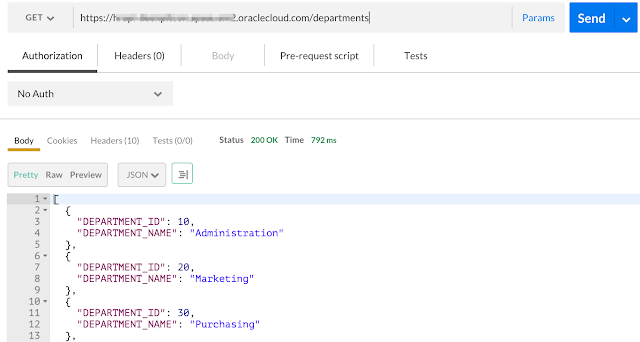 Go to https://cloud.oracle.com/ApplicationBuilder for a trial account to get started. The Load Balancing, dockerizing and scaling is fully transparent. From developer perspective you are deploying a ZIP containing a manifest.json with a command property that states what should be executed once the deployment has been installed on the specific container. In the following figure you see the overview screen of Application Container Cloud service (ACC). The PORT and HOSTNAME are given from the environment. 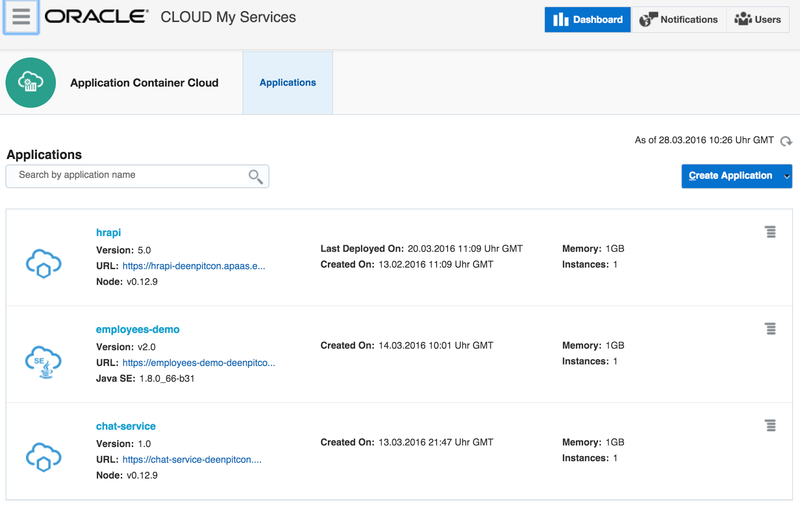 So it is in control of the application container cloud service. It expects a file server.js as the main entry point. 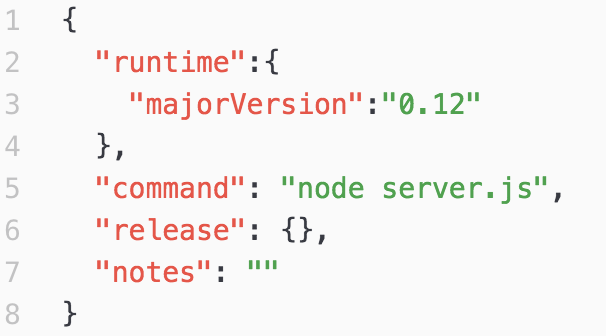 There is an official Node.js sample application (together with a Tutorial). 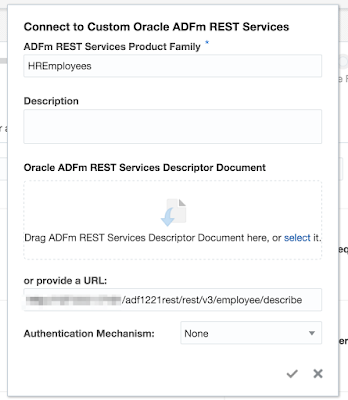 In my example I am going to create a connection to Oracle Database Cloud Service (via oracle nodedb driver) and expose DEPARTMENTS as a read online REST Resource. The most interesting part here is how to retrieve the CONNECT String to the Database. For testing on local machine defaults are used. 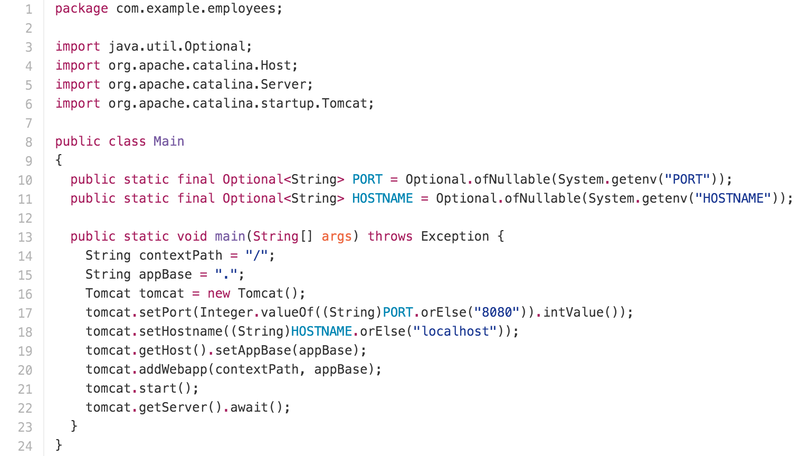 Once deployed the CONNECT String is given as an environment property (beyond PORT, USER, etc). The deployment is quite straightforward from the ACC UI using the "upload application archive" option. Further you can provide initial values for number of "Instances" and Memory. After about 5 min. the application is available through the Load balancer. 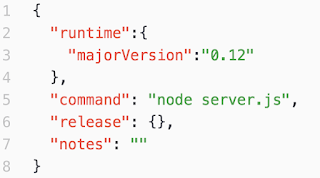 For automated deployment a REST API exists. 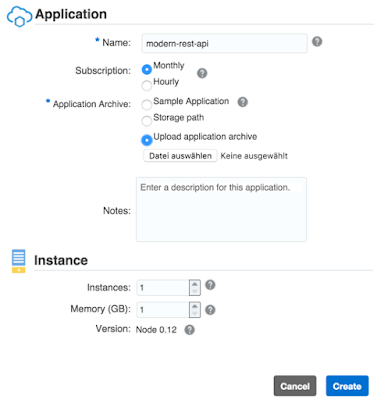 To connect to other cloud services a service binding needs to be created first. 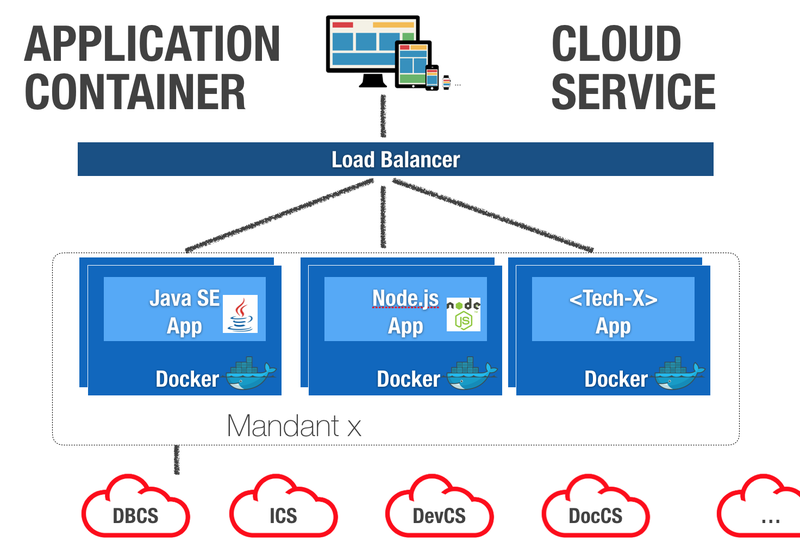 The service binding creates environment variables that are available to every application instance. Custom environment variables can be created. For example the schema user / password you want to connect with. Unfortunately just clear text values are accepted at the moment. Would be great to have a "secret type" for passwords. Further # characters are not allowed (although my schema name is c##hr ;) ). Anyway it is no major show stopper. For Java SE Apps a Flight Recording is possible. Looking forward to new features in the future versions. There is potential for a modern microservice platform. The Java SE jersey based code is available from Oracle.